Modern Couples: Art, Intimacy and the Avant-garde brings together private and public collection work showcasing the quirky and creative output of over 40 couples from the first half of the 20th century. These include paintings, sculptures and photography by a very interdisciplinary group that The Barbican has chosen for this show. Legendary duos include: Jean Arp and Sophie Taeuber- Arp; Camille Claudel and Auguste Rodin; Barbara Hepworth and Ben Nicholson; Frida Kahlo and Diego Rivera; Dora Maar and Pablo Picasso; Lee Miller and Man Ray; Varvara Stepanova and Alexander Rodchenko; Virginia Woolf and Vita Sackville-West; as well as lesser known pairings such as Emilie Flöge and Gustav Klimt, Federico García Lorca and Salvador Dalí, Romaine Brooks and Natalie Clifford-Barney and Lavinia Schulz and Walter Holdt. Just to name a few. This show was part of the Centre’s bigger project, The Art of Change; an exploration of the relationship between art, society and politics. Modern Couples hopes to highlight the ‘the way in which creative individuals came together, transgressing the constraints of their time, reshaping art, redefining gender stereotypes and forging new ways of living and loving’. Certainly an insight into how these iconic artists collaborated day to day and the effects they had on one another. Throughout the exhibition we are given a glimpse into these very intimate relationships with additional photographs, love letters and gifts given between couples. What is more, we are constantly met with the juxtaposition of these different disciplines and the harmonious way in which they are forced together through love and, more prominently, creative interest. As homosexuality was illegal in 1950s America, a lot of the photography of recording such relationships was circulated only between friends, such as George Platt Lynes’s many documentations of Paul Cadmus and Jared French. Another one that stands out is Frida Kahlo’s ‘Le Venadita (little deer)’ which she painted after a failed operation. 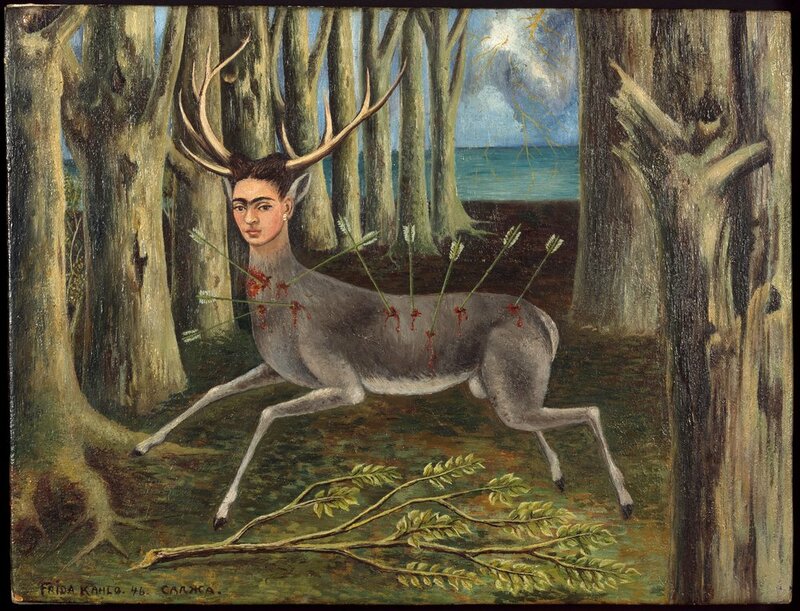 Critiqued speculation alludes to the fragility of her relationship with Diego Rivera as her self portrayal is likened to a wounded deer, which she kept as a pet. National Galleries of Scotland, Edinburgh, Presented by theTrustees of Winifred Nicholson’s estate in accordance withher wishes 1985. 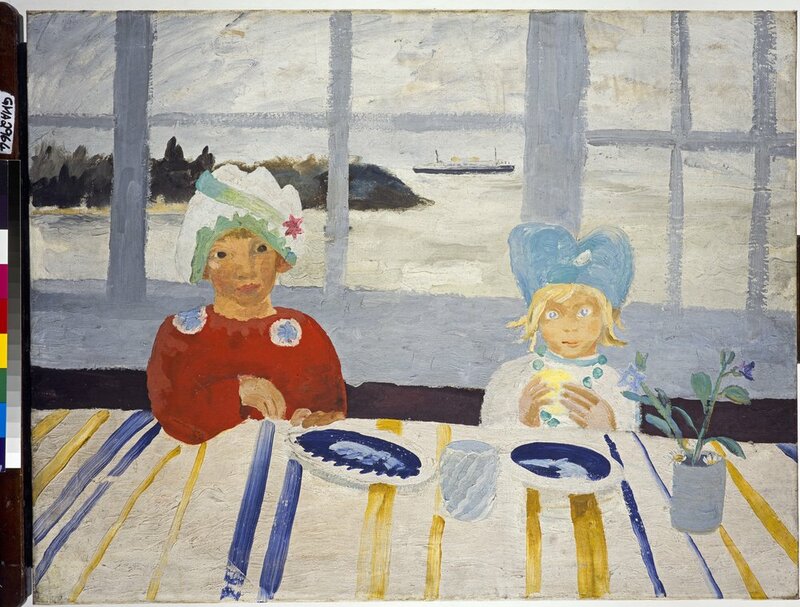 Winifred Nicholson’s relationship with Ben Nicholson led the two artists to experiment with ‘reduction and flattening of the picture plane as a means of discovering the intrinsic essence of things’, focusing on family life and, notably, their children. Part of the exhibit highlights Natalie Clifford Barney’s The Temple de l’Amitie (The Temple of Friendship), an organised event in Parisian salons that was dedicated to embracing female desire and artistic innovation. Here we see Tamara de Lempicka’s Les Deux Amies (1923) amongst other paintings and photography celebrating creative lesbian and bisexual community of the time. Literature is also key in Modern Couples , with Virginia Woolf’s Orlando: A Biography manuscript on display, as well as first editions of her husband’s work, Leonard Woolf. Poems scatter the gallery walls, including those by Brazilian sculptor Maria Martins for Marcel Duchamp and numerous other’s from Federico García Lorca’s ‘Ode To Salvador Dali’. Turner Prize 2018 exhibition installation view, Tate Britain (26 September 2018 - 9 January 2019). Now in its 34th exposition, The Turner Prize this year is hosted at Tate Britain and sees work from Forensic Architecture, Naeem Mohaiemen, Charlotte Prodger and Luke Willis Thompson. 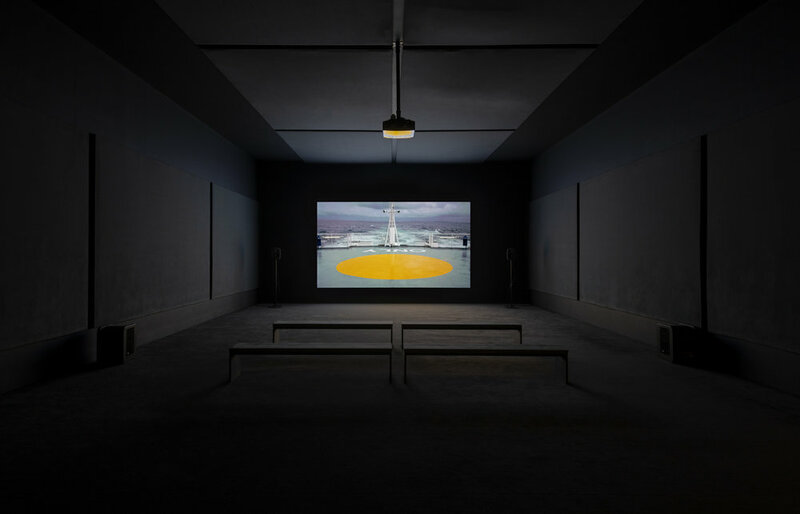 Every year, the Turner Prize selects four British based artists for outstanding exhibits from the previous year and this time judges seemed to have unanimously favoured moving image and video, arguably meriting light onto a recently widely used medium in contemporary art. Within these four exhibits, we see video being used in a range of ways and to different effects, from iPhone shooting to 35mm projections to 3D models overlaid with combined videos and aerial shots. This is perhaps the most testimonial to the Prize’s single aim of questioning and tackling contemporary art and constantly checking if our definition of it is in need of an update. That’s not to say that The Turner Prize has run without its critiques, with a most popular phrase used in review playing on a pun of William Turner ‘turning in his grave’. But we think differently, by choosing to believe in the power of discourse as a model of progress; in such instances the choice of nominees this year bring into discussion all aspects of this world-renowned competition, and ultimately those partaking in the debate are left a little wiser. The exhibition is on display on the main floor and the layout sees an open space, centred with a table lined with contemporary reading material corresponding to the four pieces. The walls hold entrance to each room where films are either played on constant loop, as with Forensic Architecture, Charlotte Prodger and Luke Willis Thompsons; or at timed intervals as with Naeem Mohaiemen’s two films. With a total combined time of 241min and 90sec, excluding that of Forensic Architecture, this years prize demands prolonged attention and commitment, decreasing possibilities of snap judgements. While bearing in mind that this is an art competition, judging the winner can be trickier than first perceived as this ‘artistic expression’ has to be measured to some degree. Fortunately, this is easily recognised with this year’s winner, Scottish artist Charlotte Prodger. Charlotte Prodger, BRIOGIT20l 6, single-channel HD video. Turner Prize 2018 exhibition installation view, Tate Britain (26 September 2018 - 9 January 2019). With very still moving images overlaid with poetic speech, in what she calls her most autobiographical work, we can identify testimony to contemporary video as a work of art. The title ‘BRIDGIT’ is chosen from a Neolithic deity and forms part of the spoken audio of the film. And this consideration of the name and its time tie in with the rest of the transcript that draws heavily on notions of identity and Prodger’s personal experiences, as what is read aloud is material from her diaries and correspondences. Timed intervals of image and softs silences combine well in allowing us to reflect on the words spoken. 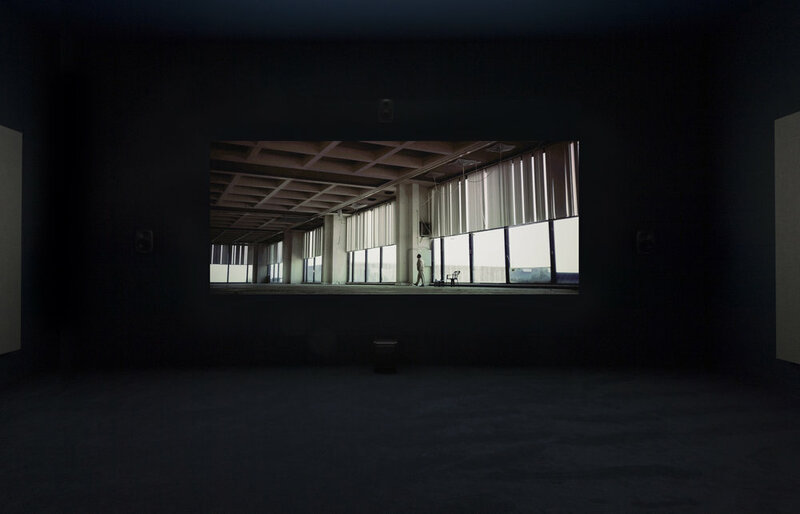 Naeem Mohaiemen, Tripoli Cancelled 2017, single-channel video, Turner Prize 2018 exhibition installation view, Tate Britain (26 September 2018 - 9 January 2019). 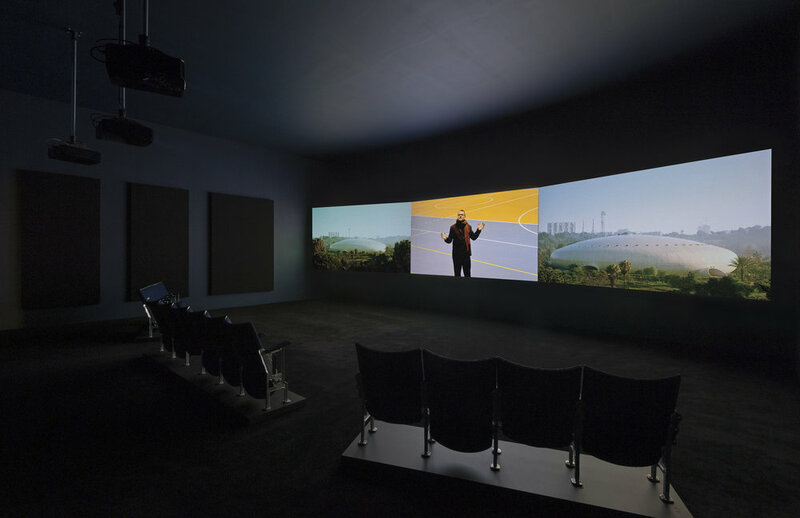 Naeem Mohaiemen, Two Meetings and a Funeral 2017, three-channel video, Turner Prize 2018 exhibition installation view, Tate Britain (26 September 2018 - 9 January 20191. Bangladeshi artist Naeem Mohaiemen’s Tripoli Cancelled is a work inspired by his father being trapped in Athen’s Ellinikon Airport in 1977. While in reality, he was there for only nine days, this fictional film sees a week in the life of the protagonist as he passes days in his ninth year in the abandoned airport. It focuses ‘on the isolation of modern life, and the ways we find hope through the stories we tell ourselves and our loved ones’. as Naeem puts it. Two Meetings and a Funeral follows the power struggle between the Non-Aligned Movement (NAM) and the Organisation of Islamic Cooperation (OIC), following two meetings in 1973 and 1974. At 89 minutes long, the underlying focus of this documentary is to bridge a gap of knowledge in generations when it comes to countries of NAM, and especially Bangladesh. Luke Willis Thompson, autoportrait 2017, 35mm. Turner Prize 2018 exhibition installation view, Tate Britain (26 September 2018 - 9 January 2019). New Zealand born Luke Willis Thompson’s display is nothing short of visually impressive as we are first met with a grand projector emitting an intimidating whirl and plastering on the back wall a loop of black and white portraits of Diamond Reynolds, Brandon and Graeme, who are relatives of UK state violence victims from the 1980s (and that’s all we know). Forensic Architecture, The Long Duration of a Split Second consisting of two projects Killing in Umm al-Hiran 18 January 2017, Negev/Naqab, Israel/Palestine, Investigation: 2017-ongoi ng, video, model, texts and Traces of Bedouin Inhabitation 7 945-present, Negev/Naqab, Israel/Palestine, Investigation 2015-ongoing, video, aerial images, text. Turner Prize 2018 exhibition installation view, Tate Britain (26 September 2018 - 9 January 2019). Lastly, Forensic Architecture (FA), a collaborative of 17 architects, filmmakers, scientists and lawyers are nominated for their extensive work into the events of January 18th and the attempt by Israeli police to ‘clear an unrecognised Bedouin village resulted in the deaths of two people.’ These two people were Yakub Musa Abu al-Qi’an, a Bedouin and resident of the village, and Erez Levi, an Israeli policeman. Initially broadcast as a terror attack by Israeli Police, the relentless work by FA eventually cast light on a true and undeniable reconstruction of the events of the night. The exhibition walls follow this chronology, with explanatory videos of each stage of findings that contradict all that which official Israeli documents have released. There is also an additional general examination piece that is an ongoing investigation from 2010. It looks at the geography of the Negev/Naqab desert and makes a map of the history of habitation in the area predating the formation of the State of Israel. The imagery of these lands are only available at low resolution, with evidence of life unidentifiable. Together with recording official documents from residents, FA used their own aerial photography means to capture the region and match outlines with RAF imagery from 1945 to make a case against the Israel Land Administration’s claims for trespassing. This is but an example of the innovative ways in which this collective work in search of the truth in these very political times. Nothing short of inspiring, they truly deserved to win.